The FEZ Berlin makes tents and marquees of various sizes available for holiday camps and other events aimed at children and young people. They can be borrowed for a small fee and we will try to accommodate all requests. This service, provided by the FEZ, is only possible thanks to the generous support of the Landesjugendamt für Bildung, Jugend und Sport (State Office for Youth Welfare, Education and Sport). 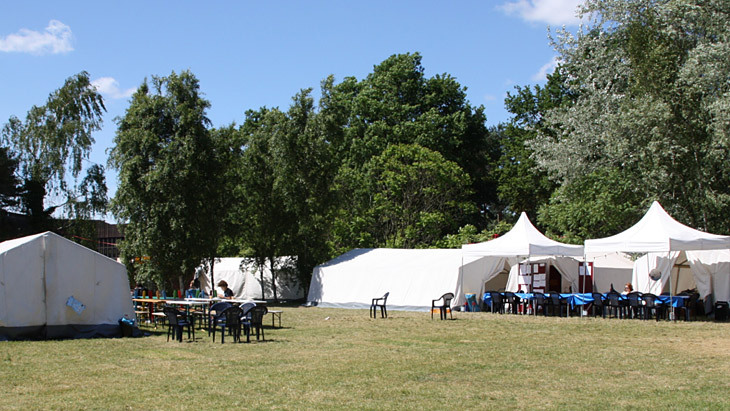 If you would like to apply for usage of our tents and marquees on behalf of your group for a youth event or holiday camp, then this can be done via the State Youth Office (Jugendeinrichtung des Senats), one of the Berlin district offices (Bezirksamt), your school or your voluntary youth group. You are not authorised to allow other parties to use the tents without our prior consent and failure to comply with this could lead to further action being taken. Please note: we do not intend to lend this equipment to private individuals. We would ask that any applications for the Easter or Whitsun holidays are sent to us by post before 1st March in their original form and with a valid signature. Failure to do so may result in your application being rejected as we have limited availability during this period. To apply for the tents, simply send us an original headed letter or a letter with your sponsor's or group's stamp and inform us of the nature and location of the youth event for which the tents are intended. Please also specify a Berlin-based telephone number and address and don't forget to include an original signature. We will then inform you about whether your application was successful depending on your required number of tents being available at the desired time. You will be charged the cost of replacements for any material that is not promptly returned after the event has finished. If you need to cancel your request to borrow tent material, we would appreciate it if you could inform us one month before the order date for summer holiday events and 2 days before the order date at other times. For cancellations occurring at shorter notice, we charge an administrative fee totalling 10% of the payment that would have been due, or €10 for payments under €100. The signing of a contract valid by civil law and the return of materials after the conclusion of the contract can only be undertaken by the borrower or a representative of the borrower who has the written permission of the borrower to do so. During both the collection and the return of the materials the borrower or his representative must observe and participate in an inspection to ensure all materials are complete and undamaged. The borrower agrees to take diligent care of the materials and ensure they are used solely for the purpose stated in the application. The borrower is responsible for returning the materials in a clean and dry condition as stated in this contract. Any damaged materials or damaged components of materials are to be reported along with the cause of the damage. Should the materials not be returned within the agreed time period, the borrower is liable to pay the daily fees as agreed upon in the contract for each day after the deadline during which the materials are not returned. The borrower is obliged to replace any lost materials or materials that become unusable due to damage caused during the time in which the materials are in the borrower's possession. Such losses or damage to material will not be covered by the lender's insurance. The borrower shall not pass the materials on to third parties and is obliged to inform all those who use the materials in accordance with this contract about the terms of the contract. Firstly, place the tent poles on the floor and separate the tent pegs. The 3-pronged tent pegs go at the front and back of the tent and the 4-pronged tent pegs go in the middle. At this stage, only the roof and eave poles are connected, beginning at the top gable. Complete a field from binder to binder before moving onto the next field. The side poles are not required for the time being. The ceiling frame is low enough to put the tent skin on. The skin is rolled out, played on the roof ridge and pulled down sideways to the eave poles. The frame is then lifted on one side and placed simultaneously and evenly on the side gables. The side supports with base plates are then attached evenly to the side gables and the tent skin is rolled down the side. It can then be attached immediately to the base plates. Then do the same on the other side of the tent. When fixing the tent skin in place, it's important that it's not too tightly attached to the various base plates, as the fabric can shrink slightly if it absorbs water or damp. It must be able to adapt to the frame of the tent. Before anchoring the tent frame to the ground, it needs to be alligned. That is to say, that the frame, which spreads out as a result of the elasticity of the poles and the weight of the tent skin, must be moved closer together, so that it has the same dimensions, as outlined in the list above. The entrance to the tent must be easy to open and close without the cords being too tight. The round pegs should be struck into the ground through the slits of the base plates and the tread plates are intended for additional fastenings of the tent. On each corner of the tent, you'll find rings that can be used for attaching guy lines. These should only be used in exceptional circumstances however, as they increase the tension in the tent skin.